Starring: Brad Pitt (Babel), Mireille Enos (Gangster Squad), James Badge Dale (The Grey) and more. Rated: Rated PG-13 for disturbing sequences/images, violence and frightening zombie scenes. The undead have never gone out of fashion it seems in media. From Frankenstein to Night of the Living Dead to Dawn of the Dead and more, the undead in form of vampires, zombies, stitched together monsters and otherwise have caused thrills, shrieks, tears and screams for countless fans over the years. 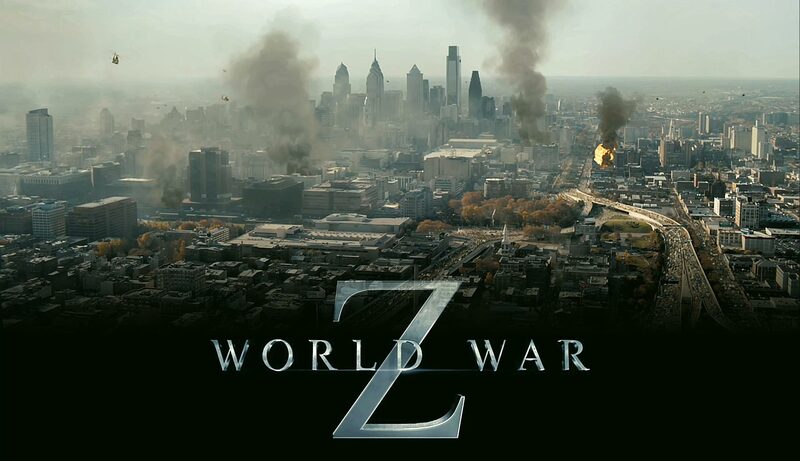 Hit the jump to see if it’s worth fighting to see World War Z. 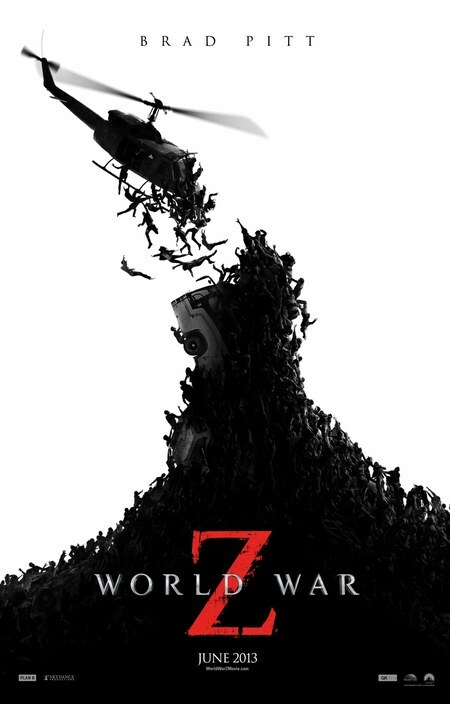 Apparently similar yet quite different from the 2006 Max Brooks horror novel on which it is based, World War Z stars Brad Pitt in a passion project of his that takes a unique, and at the same time familiar, look at an apocalyptic threat of zombies. The trailers never had me sold on the film (fast moving zombies? ball of speedy CGI mess of faces and appendages moving like a wave? 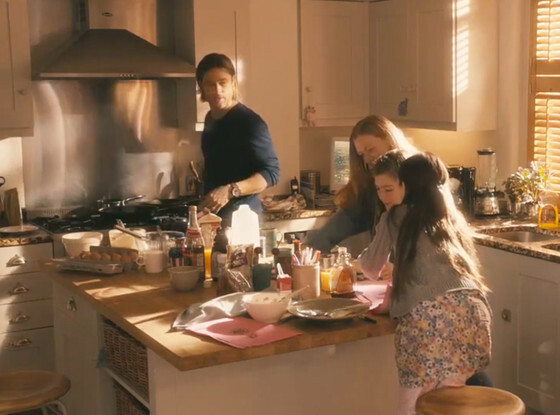 Brad Pitt a family man?) and so I went in with low expectations of this film. 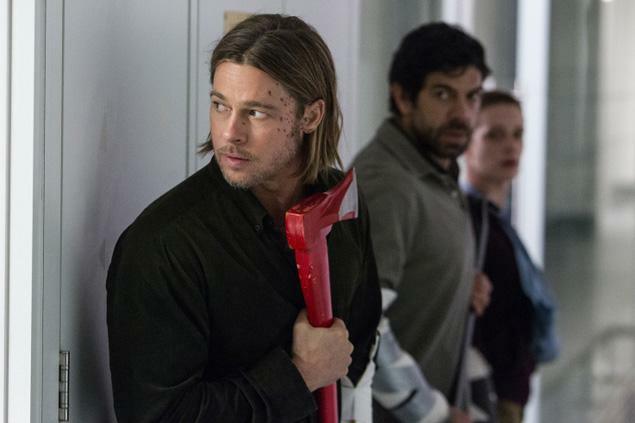 Those low expectations paid off, but weren’t completely necessary as World War Z is a decent summer flick that surprised me. Full of aspects that tend to be borrowed from 28 Days Later, Contagion and the Xbox game “Left For Dead,” World War Z brings on the frights through the fictional reality a zombie epidemic that ravages the entire world. I am not a Brad Pitt hater, but I had a feeling this film would be 95% centered around him and had my doubts. It is still 95% focused on the Pitt, but he really sells the fear, the action, the emotion and the fortitude one would expect to see from a character in his position. The real world response of such a pandemic is what enables to film to lock in on the fear factor of the brain. So many moments of intense squirming in your chair will keep the attention as characters here and there scramble for their lives from uncertain doom. 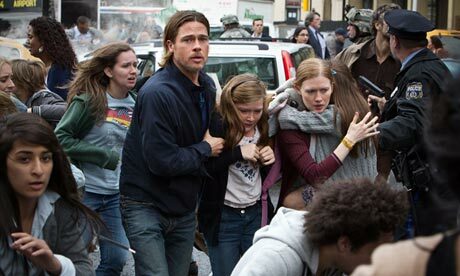 The science involved in the story really brings in the plausibility factor to ground level, but also ushers in the predictability that keeps World War Z‘s surprise factor at bay. It may make you squirm and shriek, but the anti-climatic may make you more upset, unfortunately. Perhaps a result of so many productions problems, rewrites and reshoots, but the way in which it all ties together is too neat. Much like the alternate ending of I Am Legend (for which I am glad it remained the alternate ending), World War Z ends in a way that is set up and expected. The road there is tumultuous but through it all, we care little to nothing for any of the characters they spend time to introduce us to (not even his family, really) which makes the time spent to do so seem a bit wasted as it could’ve been spent on the zombies rampage then and explaining a bit more about them (We’ll chalk it up to poor editing given the post-production issues). 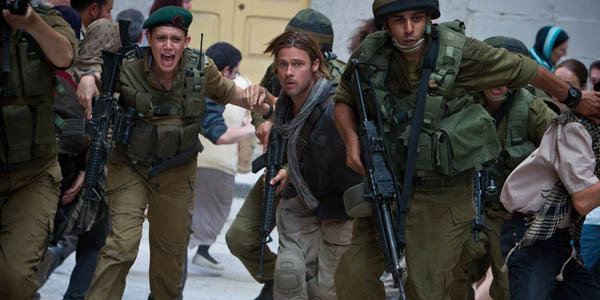 World War Z: Brad Pitt’s career isn’t as dead yet as the zombies he was fighting. Check it out. Next Movie News Monday for June 24, 2013. It’s a good middle-of-the-road thriller. Far from a horror flick (which, arguably, every zombie flick should be horror). Let me know what you think! Yup. 3 out of 5 is about right, the PG13 rating DID hurt it, and the ending WILL upset people. did you see the original proposed, and much bleaker, ending? I liked it more…and it explained Matthew Fox’s useless character. The direction is solid, but the script blows and really ruins the movie in the end. Nice review T.
yep. the ending was a ruin for me too. I am curious where they will go with the sequel. Thanks for the comment Dan. 3 out 5 stars is my score too, I thought the first half was excellent and I appreciate they included a few sequences that happened in the book even though the film is nothing like the book. It’s quite obvious that the second was changed, it went from an action/adventure to suspense/thriller. That changed in tone really ruined the film for me. I think had stick with the original ending, the film would’ve been a lot better. And also the lack of blood and gore bugged the heck out of me, especially that scene where Pitt chopped off that soldier’s hand off. RIGHT!! the soldier hand part was so ridiculous! ha. The Walking Dead was better in special effects and scariness than this movie. sadly. I really wonder why they felt they had to hold some of the creepiness at bay.